^ The region has not adopted an official flag. However, several flags have been used to represent the entity in official settings. See Flag of Northern Syria for more. The region has an official page on Facebook. The supporters of the region argue that it is an officially secular polity with direct democratic ambitions based on a libertarian socialist ideology promoting decentralization, gender equality, environmental sustainability and pluralistic tolerance for religious, cultural and political diversity, and that these values are mirrored in its constitution, society, and politics, claiming it to be a model for a federalized Syria as a whole, rather than outright independence. Some of the criticism against the region has included claims of authoritarianism, kurdification, forced recruitment, the imprisonment and harassment of dissidents and journalists, the promotion of a radical anti-capitalist ideology, and influence from the militant Kurdistan Workers' Party. 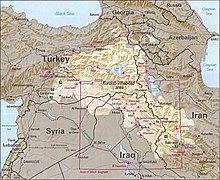 Much of northern Syria is regarded by Kurdish nationalists as Western Kurdistan (Kurdish: Rojavayê Kurdistanê‎) or Rojava (/ˌroʊʒəˈvɑː/ ROH-zhə-VAH; Kurdish: [roʒɑˈvɑ] "the West"), one of the four parts of Greater Kurdistan, and parts of northeastern Syria are considered by Syriac-Assyrians as Gozarto (Classical Syriac: ܓܙܪܬܐ‎, translit. Gozarto, meaning Upper Mesopotamia), part of the historical Assyrian homeland. On 17 March 2016, its de facto administration self-declared the establishment of a federal system of government as the Democratic Federation of Rojava – Northern Syria (Kurdish: Federaliya Demokratîk a Rojava – Bakurê Sûriyê‎; Arabic: الفدرالية الديمقراطية لروج آفا – شمال سوريا‎, translit. al-Fidirāliyya al-Dīmuqrāṭiyya li-Rūj ʾĀvā – Šamāl Suriyā; Classical Syriac: ܦܕܪܐܠܝܘܬ݂ܐ ܕܝܡܩܪܐܛܝܬܐ ܠܓܙܪܬܐ ܒܓܪܒܝܐ ܕܣܘܪܝܐ‎, translit. Federaloyotho Demoqraṭoyto l'Gozarto b'Garbyo d'Suriya; sometimes abbreviated as NSR). The updated December 2016 constitution of the polity uses the name Democratic Federation of Northern Syria (DFNS) (Kurdish: Federaliya Demokratîk a Bakûrê Sûriyê‎; Arabic: الفدرالية الديمقراطية لشمال سوريا‎, translit. al-Fidirāliyya al-Dīmuqrāṭiyya li-Šamāl Suriyā; Classical Syriac: ܦܕܪܐܠܝܘܬ݂ܐ ܕܝܡܩܪܐܛܝܬܐ ܕܓܪܒܝ ܣܘܪܝܐ‎, translit. Federaloyotho Demoqraṭoyto d'Garbay Suriya). Since 6 September 2018, the Syrian Democratic Council has adopted a new name for the region, naming it the Autonomous Administration of North and East Syria (NES) (Kurdish: Rêveberiya Xweser a Bakur û Rojhilatê Sûriyeyê‎; Arabic: الإدارة الذاتية لشمال وشرق سوريا‎; Classical Syriac: ܡܕܰܒܪܳܢܘܬ݂ܳܐ ܝܳܬ݂ܰܝܬܳܐ ܠܓܰܪܒܝܳܐ ܘܡܰܕܢܚܳܐ ܕܣܘܪܝܰܐ‎, translit. Mdabronuṯo Yoṯayto l-Garbyo w-Madnḥyo d-Suriya; Turkish: Kuzey ve Doğu Suriye Özerk Yönetimi), encompassing the Euphrates, Afrin, and Jazira regions as well as the local civil councils in the regions of Raqqa, Manbij, Tabqa, and Deir ez-Zor. The region's administration is sometimes also referred to as the "Democratic Autonomous Administration" (DAA). The Euphrates near Halabiye; the archaeological site Zalabiye can be seen in the background on the left bank. The region lies to the west of the Tigris along the Turkish border and borders Iraqi Kurdistan to the southeast. The region is at latitude approximately 36°30' north and mostly consists of plains and low hills, however there are some mountains in the region such as Mount Abdulaziz as well as the western part of the Sinjar Mountain Range in the Jazira Region. In terms of governorates of Syria, the region is formed from parts of the al-Hasakah, Raqqa, Deir ez-Zor and the Aleppo governorates. Having been part of the Fertile Crescent, Northern Syria has several Neolithic sites such as Tell Halaf. Northern Syria is part of the Fertile Crescent, and includes archaeological sites dating to the Neolithic, such as Tell Halaf. In antiquity, the area was part of the Mitanni kingdom, its centre being the Khabur river valley in modern-day Jazira Region. It was then part of Assyria, with the last surviving Assyrian imperial records, from between 604 BC and 599 BC, were found in and around the Assyrian city of Dūr-Katlimmu. Later it was ruled by the Achaemenids, Hellenes, Artaxiads, Romans, Parthians, Sasanians, Byzantines and successive Arab Islamic caliphates. Kurdish settlement in Syria goes back to before the Crusades of the 11th century. A number of Kurdish military and feudal settlements from before this period have been found in Syria. Such settlements have been found in the Alawite and north Lebanese mountains and around Hama and its surroundings. The Crusade fortress of Krak des Chevaliers, which is known in Arabic as Hisn al-Akrad (Castle of the Kurds), was originally a Kurdish military settlement before it was enlarged by the French Crusaders. Similarly, the Kurd-Dagh (Kurdish Mount) has been inhabited by Kurds for more than a millennium. In the 12th century, Kurdish and other Muslim regiments accompanied Saladin, who was a Kurd from Tikrit, on his conquest of the Middle East and establishment of the Ayyubid dynasty (1171–1341), which was administered from Damascus. The Kurdish regiments that accompanied Saladin established self-ruled areas in and around Damascus. These settlements evolved into the Kurdish sections of Damascus of Hayy al-Akrad (the Kurdish quarter) and the Salhiyya districts located in the north-east of Damascus on Mount Qasioun. The Kurdish community’s role in the military continued under the Ottomans. Kurdish soldiers and policemen from the city were tasked with both maintaining order and protecting the pilgrims’ route toward Mecca. Many Kurds from Syria’s rural hinterland joined the local Janissary corp in Damascus. Later, Kurdish migrants from diverse areas, such as Diyarbakir, Mosul and Kirkuk, also joined these military units which caused an expansion of the Kurdish community in the city. During the Ottoman Empire (1516–1922), large Kurdish-speaking tribal groups both settled in and were deported to areas of northern Syria from Anatolia. The demographics of this area underwent a huge shift in the early part of the 20th century. Some Circassian, Kurdish and Chechen tribes cooperated with the Ottoman (Turkish) authorities in the massacres of Armenian and Assyrian Christians in Upper Mesopotamia, between 1914 and 1920, with further attacks on unarmed fleeing civilians conducted by local Arab militias. Many Assyrians fled to Syria during the genocide and settled mainly in the Jazira area. Starting in 1926, the region saw another immigration of Kurds following the failure of the Sheikh Said rebellion against the Turkish authorities. While many of the Kurds in Syria have been there for centuries, waves of Kurds fled their homes in Turkey and settled in Syria, where they were granted citizenship by the French mandate authorities. In the 1930s and 1940s, the region saw several failed autonomy movements. Under Syrian rule, policies of Arab nationalism and attempts at forced Arabization have been widespread in Northern Syria, to a large part directed against the Kurdish population. The region received little investment or development from the central government and laws discriminated against Kurds owning property, driving cars, working in certain professions and forming political parties. Property was routinely confiscated by government loansharks. Kurdish language education was forbidden, compromising Kurdish students' education. Hospitals lacked equipment for advanced treatment and instead patients had to be transferred outside the region. Numerous place names were Arabized in the 1960s and 1970s. In his report for the 12th session of the UN Human Rights Council titled Persecution and Discrimination against Kurdish Citizens in Syria, the United Nations High Commissioner for Human Rights held that "Successive Syrian governments continued to adopt a policy of ethnic discrimination and national persecution against Kurds, completely depriving them of their national, democratic and human rights – an integral part of human existence. The government imposed ethnically-based programs, regulations and exclusionary measures on various aspects of Kurds’ lives – political, economic, social and cultural." In many instances, the Syrian government arbitrarily deprived ethnic Kurdish citizens of their citizenship. The largest such instance was a consequence of a census in 1962, which was conducted for exactly this purpose. 120,000 ethnic Kurdish citizens saw their citizenship arbitrarily taken away and became stateless. Kurdish private schools were banned. This status was passed to the children of a "stateless" Kurdish father. In 2010, the Human Rights Watch (HRW) estimated the number of such "stateless" Kurdish people in Syria at 300,000. In 1973, the Syrian authorities confiscated 750 square kilometres (290 square miles) of fertile agricultural land in Al-Hasakah Governorate, which was owned and cultivated by tens of thousands of Kurdish citizens, and gave it to Arab families brought in from other provinces. In 2007, in the Al-Hasakah Governorate, 600 square kilometres (230 square miles) around Al-Malikiyah were granted to Arab families, while tens of thousands of Kurdish inhabitants of the villages concerned were evicted. These and other expropriations was part of the so-called "Arab Belt initiative" which aimed to change the demographic fabric of the resource-rich region. In 2012, in the early stages of the Syrian Civil War, Syrian government forces withdrew from three mainly Kurdish areas, leaving control to local militias. Existing underground Kurdish political parties, namely the Democratic Union Party (PYD) and the Kurdish National Council (KNC), joined to form the Kurdish Supreme Committee (KSC) and the People's Protection Units (YPG) militia was established to defend Kurdish-inhabited areas in northern Syria. In July 2012, the YPG established control in the towns of Kobanî, Amuda and Afrin, and the Kurdish Supreme Committee established a joint leadership council to administer the towns. Soon YPG also gained control of the cities of Al-Malikiyah, Ras al-Ayn, al-Darbasiyah, and al-Muabbada and parts of Hasakah and Qamishli. The Kurdish Supreme Committee was dissolved in 2013, when the PYD abandoned the coalition with the KNC and established the Movement for a Democratic Society (TEV-DEM) coalition. In January 2014, three areas under TEV-DEM rule declared their autonomy as cantons (Now Afrin Region, Jazira Region and Euphrates Region) and an interim constitution was approved. From September 2014 to spring 2015, the YPG forces in Kobanî Canton, supported by some secular Free Syrian Army militias and leftist international and Kurdistan Workers' Party (PKK) volunteers, fought and finally repelled an assault by the Islamic State of Iraq and the Levant (ISIL) during the Siege of Kobanî, and in the YPG's Tell Abyad offensive of summer of 2015, the regions of Jazira and Kobanî were connected. In December 2015, the Syrian Democratic Council was created. On 17 March 2016, at a TEV-DEM-organized conference in Rmelan the establishment the Democratic Federation of Rojava – Northern Syria was declared in the areas they controlled in Northern Syria. The declaration was quickly denounced by both the Syrian government and the National Coalition for Syrian Revolutionary and Opposition Forces. In March 2016, Hediya Yousef and Mansur Selum were elected co-chairpersons for the executive committee to organise a constitution for the region, to replace the 2014 constitution. Yousef said the decision to set up a federal government was in large part driven by the expansion of territories captured from Islamic State: "Now, after the liberation of many areas, it requires us to go to a wider and more comprehensive system that can embrace all the developments in the area, that will also give rights to all the groups to represent themselves and to form their own administrations." In July 2016, a draft for the new constitution was presented, based on the principles of the 2014 constitution, mentioning all ethnic groups living in Northern Syria and addressing their cultural, political and linguistic rights. The main political opposition to the constitution have been Kurdish nationalists, in particular the KNC, who have different ideological aspirations than the TEV-DEM coalition. On 28 December 2016, after a meeting of the 151-member Syrian Democratic Council in Rmelan, a new constitution was resolved; despite objections by 12 Kurdish parties, the region was renamed the Democratic Federation of Northern Syria, removing the name "Rojava". The Regions of North and East Syria since September 2018. The political system of the region is based on its adopted constitution, officially titled "Charter of the Social Contract". The constitution was ratified on 9 January 2014; it provides that all residents of the region shall enjoy fundamental rights such as gender equality and freedom of religion. It also provides for property rights. The region's system of community government has direct democratic aspirations. "For a former diplomat like me, I found it confusing: I kept looking for a hierarchy, the singular leader, or signs of a government line, when, in fact, there was none; there were just groups. There was none of that stifling obedience to the party, or the obsequious deference to the "big man"—a form of government all too evident just across the borders, in Turkey to the north, and the Kurdish regional government of Iraq to the south. The confident assertiveness of young people was striking. However, a 2016 paper from Chatham House stated that power is heavily centralized in the hands of the Democratic Union Party (PYD). Abdullah Öcalan, a Kurdistan Workers' Party (PKK) leader imprisoned in İmralı, Turkey, has become an iconic figure in the region whose libertarian socialist ideology has shaped the region's society and politics through the ruling TEV-DEM coalition, led by the PYD which succeeded the Kurdish Supreme Committee that was established by the PYD and the Kurdish National Council (KNC) as the governing body between 2012–2013. The politics of the region has been described as having "libertarian transnational aspirations" influenced by the PKK's shift toward anarchism, but also includes various "tribal, ethno-sectarian, capitalist and patriarchal structures." The region has a "co-governance" policy in which each position at each level of government in the region includes a "female equivalent of equal authority" to a male. Similarly, there are aspirations for equal political representation of all ethno-religious components – Arabs, Kurds and Assyrians being the most sizeable ones. Some have compared this to the Lebanese confessionalist system, which is based on that country's major religions. Article 8 of the 2014 constitution stipulates that "All Cantons in the autonomous regions are founded on the principle of local self-government. Cantons may freely elect their representatives and representative bodies, and may pursue their rights insofar as it does not contravene the articles of the Charter." The cantons were later reorganized into regions with subordinate cantons/provinces, areas, districts and communes. The first communal elections in the region were held on 22 September 2017. 12,421 candidates competed for around 3,700 communal positions during the elections, which were organized by the region's High Electoral Commission. Elections for the councils of the Jazira Region, Euphrates Region and Afrin Region were held in December 2017. On 6 September 2018, during a meeting of the Syrian Democratic Council in Ayn Issa, a new name for the region was adopted, the "Autonomous Administration of North and East Syria", encompassing the Euphrates, Afrin, and Jazira regions as well as the local civil councils in the regions of Raqqa, Manbij, Tabqa, and Deir ez-Zor. During the meeting, a 70-member "General Council for the Autonomous Administration of North and East Syria" was formed. In December 2015, during a meeting of the region's representatives in Al-Malikiyah, the Syrian Democratic Council (SDC) was established to serve as the political representative of the Syrian Democratic Forces. The co-leaders selected to lead the SDC at its founding were prominent human rights activist Haytham Manna and TEV-DEM Executive Board member Îlham Ehmed. The SDC appoints an Executive Council which deal with the economy, agriculture, natural resources, and foreign affairs. General elections were planned for 2014 and 2018, but this was postponed due to fighting. Among other stipulations outlined is a quota of 40% for women’s participation in government, and quota for youth. In connection with a decision to introduce affirmative action for ethnic minorities, all governmental organizations and offices are based on a co-presidential system. Under the rule of the Ba'ath Party, school education consisted of only Arabic language public schools, supplemented by Assyrian private confessional schools. In 2015, the region's administration introduced primary education in the native language (either Kurdish or Arabic) and mandatory bilingual education (Kurdish and Arabic) for public schools, with English as a mandatory third language. There are ongoing disagreements and negotiations over curriculums with the Syrian central government, which generally still pays the teachers in public schools. In August 2016, the Ourhi Centre was founded by the Assyrian community in the city of Qamishli, to educate teachers in order to make Syriac-Aramaic an additional language in public schools in Jazira Region, which then started in the 2016/17 academic year. According to the region's Education Committee, in 2016/2017 "three curriculums have replaced the old one, to include teaching in three languages: Kurdish, Arabic and Syriac." In August 2017 Galenos Yousef Issa of the Ourhi Centre announced that the Syriac curriculum would be expanded to grade 6, which earlier had been limited to grade 3, with teachers being assigned to Syriac schools in Al-Hasakah, Al-Qahtaniyah and Al-Malikiyah. At the start of the academic year 2018–2019, the curricula in Kurdish and Arabic had been expanded to grades 1–12 and Syriac to grades 1–9. "Jineology" classes had also been introduced. The federal, regional and local administrations in the region put much emphasis on promoting libraries and educational centers, to facilitate learning and social and artistic activities. Examples are the Nahawand Center for Developing Children’s Talents in Amuda (est. 2015) and the Rodî û Perwîn Library in Kobani (May 2016). For Assyrian private confessional schools there had at first been no changes. However, in August 2018 it was reported that the region's authorities was trying to implement its own Syriac curriculum in private Christian schools that have been continuing to use an Arabic curriculum with limited Syriac classes approved by the Assad regime and originally developed by Syrian Education Ministry in cooperation with Christian clergy in the 1950s. The threatening of the closure of schools not complying with this resulted in protests erupting in Qamishli. A deal was later reached in September 2018 between the region's authorities and the local Syriac Orthodox archbishopric, where the two first grades in these schools would learn the region's Syriac curriculum and grades three to six would continue to learn the Damascus approved curriculum. While there was no institution of tertiary education on the territory of the region at the onset of the Syrian Civil War, an increasing number of such institutions have been established by the regional administrations in the region since. In September 2014, the Mesopotamian Social Sciences Academy in Qamishli started classes. More such academies designed under a libertarian socialist academic philosophy and concept are in the process of founding or planning. In August 2015, the traditionally-designed University of Afrin in Afrin started teaching, with initial programs in literature, engineering and economics, including institutes for medicine, topographic engineering, music and theater, business administration and the Kurdish language. In July 2016, Jazira Canton Board of Education started the University of Rojava in Qamishli, with faculties for Medicine, Engineering, Sciences, and Arts and Humanities. Programs taught include health, oil, computer and agricultural engineering; physics, chemistry, history, psychology, geography, mathematics and primary school teaching and Kurdish literature. Its language of instruction is Kurdish, and with an agreement with Paris 8 University in France for cooperation, the university opened registration for students in the academic year 2016–2017. In August 2016 Jazira Canton police forces took control of the remaining parts of Hasakah city, which included the Hasakah campus of the Arabic-language Al-Furat University, and with mutual agreement the institution continues to be operated under the authority of the Damascus government's Ministry of Higher Education. Incorporating the Universal Declaration of Human Rights, the International Covenant on Civil and Political Rights, the International Covenant on Economic, Social and Cultural Rights, as well as other internationally recognized human rights conventions, the 2014 Constitution of North and East Syria guarantees freedom of speech and freedom of the press. As a result, a diverse media landscape has developed in the region, in each of the Kurdish, Arabic, Syriac-Aramaic and Turkish languages of the land, as well as in English, and media outlets frequently use more than one language. Among the most prominent media in the region are Hawar News Agency and ARA News agencies and websites as well as TV outlets Rojava Kurdistan TV, Ronahî TV, and the bimonthly magazine Nudem. A landscape of local newspapers and radio stations has developed. However, media agencies often face economic pressure, as was demonstrated by the closure of news website Welati in May 2016. Political extremism in the context of the Syrian Civil War can put media outlets under pressure; for example in April 2016 the premises of Arta FM ("the first, and only, independent radio station staffed and broadcast by Syrians inside Syria") in Amuda was threatened and burned down by unidentified assailants. During the Turkish military operation in Afrin, the KDP-affiliated Iraqi Kurdish Rudaw Media Network was also banned from reporting in the region. International media and journalists operate with few restrictions in the region, one of the only regions in Syria where they can operate with some degree of freedom. This has led to several international media reports regarding the region, including major TV documentaries like BBC documentary (2014): Rojava: Syria's Secret Revolution or Sky1 documentary (2016): Rojava – The Fight Against ISIS. Internet connections in the region are often slow due to inadequate infrastructure. Internet lines are operated by Syrian Telecom, which as of January 2017 is working on a major extension of the fibre optic cable network in southern Jazira Region. After the establishment of the de facto autonomous region, the Center of Art and Democratic Culture, located in Jazira Region, has become a venue for aspiring artists who showcase their work. Among major cultural events in the region is the annual Festival of Theater in March/April as well as the Rojava Short Story Festival in June, both in the city of Qamishli, and the Afrin Short Film Festival in April. The Jazira Region is a major wheat and cotton producer and has a considerable oil industry. The Euphrates Region suffered most destruction of the three regions and has huge challenges in reconstruction, and has recently seen some greenhouse agriculture construction. The Afrin Region has had a traditional specialization on olive oil including Aleppo soap made from it, and had drawn much industrial production from the nearby city of Aleppo due to the fighting in Aleppo city from 2012-2016. Price controls are managed by local committees, which can set the price of basic goods such as food and medical goods. It has been theorized that the Assad government had deliberately underdeveloped parts of Northern Syria for the purposes of Arabization of the region as well as making secession attempts less likely. During the Syrian Civil War, the infrastructure of the region has on average experienced less destruction than other parts of Syria. In May 2016, Ahmed Yousef, head of the Economic Body and chairman of Afrin University, claimed that at the time, the economic output of the region (including agriculture, industry and oil) accounted for about 55% of Syria's gross domestic product. In 2014, the Syrian government was still paying some state employees, but fewer than before. The administration of the region has however stated that "none of our projects are financed by the regime". There were at first no direct or indirect taxes on people or businesses in the region; the administration raised money mainly through tariffs and selling oil and other natural resources. However in July 2017, it was reported that the administration in the Jazira Region had started to collect income tax to provide for public services in the region. In May 2016, The Wall Street Journal reported that traders in Syria experience the region as "the one place where they aren't forced to pay bribes." The main sources of revenue for the autonomous region have been presented as: 1. Income from public properties such as grain silos as well as from oil and gas in the Jazira Region, 2. Income from local taxation and customs fees taken at the border crossings, 3. Income from service delivery, 4. Finances sent from expats in Iraq and Turkey and 5. Local donations. In 2015 the autonomous administration of the region shared information regarding the region's finances in which the total amount of revenue for the year of 2014 for the autonomous administration was about 3 billion Syrian Pounds (≈5.8 million USD) from which 50% was spent on "self-defense and protection", 18% for the Jazira Canton (now Jazira Region), 8.5% for the Kobani Canton (now Euphrates Region), 8.5% for the Afrin Canton (now Afrin Region), 15% for the "Internal Committee" and any remainder as a reserve for use in the following year. Oil and food production is substantial, so they are important exports. Agricultural products include sheep, grain and cotton. Important imports are consumer goods and auto parts. Trade with Turkey and access to humanitarian and military aid is difficult due to a blockade by Turkey. Turkey does not allow businesspeople or goods to cross its border. The blockade from adjacent territories held by Turkey and ISIL, and partially also the KRG, temporarily caused heavy distortions of relative prices in Jazira Region and Euphrates Region (while separate, Afrin Region borders government-controlled territory since February 2016); for example in Jazira Region and Euphrates Region, through 2016 petrol cost only half as much as bottled water. The Semalka Border Crossing with Iraqi Kurdistan had been intermittently closed by the Kurdistan Regional Government (KRG), but has been open permanently since June 2016, and along with the establishment of a corridor to Syrian government controlled territory in April 2017, economic exchange has increasingly normalized. Further, in May 2017 in northern Iraq, the Popular Mobilization Forces fighting ISIL cleared a corridor connecting the autonomous region and Iraqi government-controlled territory. The autonomous administration is supporting efforts for workers to form cooperatives, such as this sewing cooperative in Derik. The autonomous region is ruled by a coalition which bases its policy ambitions to a large extent on the libertarian socialist ideology of Abdullah Öcalan and have been described as pursuing a model of economy that blends co-operative and private enterprise. In 2012, the PYD launched what it called the "Social Economy Plan", later renamed the "People's Economy Plan" (PEP). Private property and entrepreneurship are protected under the principle of "ownership by use". Dr. Dara Kurdaxi, a regional official, has stated: "The method in Rojava is not so much against private property, but rather has the goal of putting private property in the service of all the peoples who live in Rojava." Communes and co-operatives have been established to provide essentials. Co-operatives account for a large proportion of agricultural production and are active in construction, factories, energy production, livestock, pistachio and roasted seeds, and public markets. Several hundred instances of collective farming have occurred across towns and villages in the region, with communes consisting of approximately 20–35 people. According to the region's "Ministry of Economics", approximately three quarters of all property has been placed under community ownership and a third of production has been transferred to direct management by workers' councils. Syrian civil laws are valid in the region if they do not conflict with the Constitution of the autonomous region. One notable example for amendment is personal status law, which in Syria is based on Sharia and applied by Sharia Courts, while the secular autonomous region proclaims absolute equality of women under the law, allowing civil marriage and banning forced marriage, polygamy and underage marriage. A new criminal justice approach was implemented that emphasizes restoration over retribution. The death penalty was abolished. Prisons house mostly people charged with terrorist activity related to ISIL and other extremist groups. A September 2015 report of Amnesty International noted that 400 people were incarcerated by the region's authorities and criticized deficiencies in due process of the judicial system of the region. The justice system in the region is influenced by Abdullah Öcalan's libertarian socialist ideology. At the local level, citizens create Peace and Consensus Committees, which make group decisions on minor criminal cases and disputes as well as in separate committees resolve issues of specific concern to women's rights like domestic violence and marriage. At the regional level, citizens (who need not be trained jurists) are elected by the regional People's Councils to serve on seven-member People's Courts. At the next level are four Appeals Courts, composed of trained jurists. The court of last resort is the Regional Court, which serves the region as a whole. Separate from this system, the Constitutional Court renders decisions on compatibility of acts of government and legal proceedings with the constitution of the region (called the Social Contract). Members of the Raqqa Internal Security Forces (RISF) in Ayn Issa. Policing in the region is performed by the Asayish armed formation. Asayish was established on July 25, 2013 to fill the gap of security when the Syrian security forces withdrew. Under the Constitution of North and East Syria, policing is a competence of the regions. The Asayish forces of the regions are composed of 26 official bureaus that aim to provide security and solutions to social problems. The six main units of Asayish are Checkpoints Administration, Anti-Terror Forces Command (HAT), Intelligence Directorate, Organized Crime Directorate, Traffic Directorate and Treasury Directorate. 218 Asayish centers were established and 385 checkpoints with 10 Asayish members in each checkpoint were set up. 105 Asayish offices provide security against ISIL on the frontlines across Northern Syria. Larger cities have general directorates responsible for all aspects of security including road controls. Each region has a HAT command, and each Asayish center organizes itself autonomously. Throughout the region, the municipal Civilian Defense Forces (HPC) and the regional Self-Defense Forces (HXP) also serve local-level security. In Jazira Region, the Asayish are further complemented by the Assyrian Sutoro police force, which is organized in every area with Assyrian population, provides security and solutions to social problems in collaboration with other Asayish units. The Khabour Guards and Nattoreh, though not police units, also have a presence in the area, providing security in towns along the Khabur River. The Bethnahrain Women's Protection Forces also maintain a police branch. In the areas taken from ISIL during the Raqqa campaign, the Raqqa Internal Security Forces and Manbij Internal Security Forces operate as police forces. Deir ez-Zor also maintain an Internal Security Forces unit. Female fighters of the YPJ play a significant combat role in the region. HXP militiamen on parade in 2016. The main military force of the region is the Syrian Democratic Forces, an alliance of Syrian rebel groups formed in 2015. The SDF is led by the Kurdish majority People's Protection Units (Yekîneyên Parastina Gel, YPG). The YPG was founded by the PYD after the 2004 Qamishli clashes, but was first active in the Syrian Civil War. There is also the Syriac Military Council (MFS), an Assyrian militia associated with the Syriac Union Party. There are also Free Syrian Army groups in the alliance such as Jaysh al-Thuwar and the Northern Democratic Brigade, tribal militias like the Al-Sanadid Forces, and municipal military councils in the Shahba region, like the Manbij Military Council, the Al-Bab Military Council or the Jarablus Military Council. The Self-Defence Forces (HXP) is a territorial defense militia and the only conscript armed force in the region. HXP is locally recruited to garrison their municipal area and is under the responsibility and command of the respective regions of the NES. Occasionally, HXP units have supported the YPG, and SDF in general, during combat operations against ISIL outside their own municipality and region. In the course of the Syrian Civil War, militias associated with the autonomus region have been accused of war crimes, in particular members of the People's Protection Units (YPG), including 2014 and 2015 reports by Human Rights Watch and Amnesty International, both of which operate freely in the region. The claims from 2014 include claims of arbitrary arrests and torture, other claims include the use of child soldiers. In October 2015 the YPG demobilized 21 minors from the military service in its ranks. Accusations have been comprehensively debated and contested by both the YPG and other human rights organizations. YPG members since September 2015 receive human rights training from Geneva Call and other international organizations. The region's civil government has been hailed in international media for human rights advancement in particular in the legal system, concerning women's rights, ethnic minority rights, freedom of Speech and Press and for hosting inbound refugees. The political agenda of "trying to break the honor-based religious and tribal rules that confine women" is controversial in conservative quarters of society. Enforcing conscription into the Self-Defence Forces (HXP) has been called a human rights violation from the perspective of those who consider the region's institutions as illegitimate. Some persistent issues under the region's administration concern ethnic minority rights. One issue of contention is the consequence of the Baathist Syrian government's settling of Arab tribal settlers, expropriated for the purpose from its previous Kurdish owners in 1973 and 2007, There have been calls to expel the settlers and return the land to their previous owners, which has led the political leadership of the region to press the Syrian government for a comprehensive solution. The demographics of the region have historically been highly diverse. One major shift in modern times was in the early part of the 20th century due to the Assyrian and Armenian Genocides, when many Assyrians and Armenians fled to Syria from Turkey. This was followed by many Kurds fleeing Turkey in the aftermath of Sheikh Said rebellion. Another major shift in modern times was the Baath policy of settling additional Arab tribes in Northern Syria. Most recently, during the Syrian Civil War, many refugees have fled to the north of the country. Some ethnic Arab citizens from Iraq have fled to Northern Syria as well. However, as of January 2018, only two million people are estimated to remain in the area under the region's administration with estimates of around half a million people emigrating since the beginning of the civil war, to a large degree because of the economic hardships the region has faced during the war. Kurds are an ethnic group living in northeastern and northwestern Syria, culturally and linguistically classified among the Iranian peoples. Many Kurds consider themselves descended from the ancient Iranian people of the Medes, using a calendar dating from 612 B.C., when the Assyrian capital of Nineveh was conquered by the Medes. Kurds formed 55% of the 2010 population of what now is both Jazira Region and Euphrates Region. During the Syrian civil war, many Kurds who had lived elsewhere in Syria fled back to their traditional lands in Northern Syria. Arabs are an ethnic group or ethnolinguistic group living throughout Northern Syria, mainly defined by Arabic as their first language. They encompass Bedouin tribes who trace their ancestry to the Arabian Peninsula as well as Arabized indigenous peoples. Arabs form the majority or plurality in some parts of Northern Syria, in particular in the southern parts of the Jazira Region, in Tell Abyad District and in Azaz District. While in Shahba region the term Arab is mainly used to denote Arabized Kurds and Arabized Syrians, in Euphrates Region and in Jazira Region it mainly denotes ethnic Arab Bedouin populations. Assyrians are an ethnoreligious group. Their presence in Syria is in the Jazira Region of the autonomous region, particularly in the urban areas (Qamishli, al-Hasakah, Ras al-Ayn, Al-Malikiyah, Al-Qahtaniyah), in the northeastern corner and in villages along the Khabur River in the Tell Tamer area. They traditionally speak varieties of Syriac-Aramaic, a Semitic language. There are many Assyrians among recent refugees to Northern Syria, fleeing Islamist violence elsewhere in Syria back to their traditional lands. In the secular polyethnic political climate of the region, the Dawronoye modernization movement has a growing influence on Assyrian identity in the 21st century. Turkmen are an ethnic group with a major presence in the area between Afrin Region and Euphrates Region, where they form regional majorities in the countryside from Azaz and Mare' to Jarabulus, and a minor presence in Afrin Region and Euphrates Region. There are also smaller minorities of Armenians throughout Northern Syria as well as Chechens in Ras al-Ayn. Regarding the status of different languages in the autonomous region, its "Social Contract" stipulates that "all languages in Northern Syria are equal in all areas of life, including social, educational, cultural, and administrative dealings. Every people shall organize its life and manage its affairs using its mother tongue." In practice, Arabic and Kurmanji are predominantly used across all areas and for most official documents, with Syriac being mainly used in the Jazira Region with some usage across all areas while Turkish and Circassian are also used in the region of Manbij. Kurdish (in Northern Kurdish dialect), a Northwestern Iranian language from the Indo-European language family. Syriac-Aramaic mainly in the Surayt/Turoyo and Assyrian Neo-Aramaic varieties (mainly Classical Syriac in writing), Northwest Semitic languages from the Semitic language family. Turkish (in Syrian Turkmen dialect), from the Turkic language family. Most ethnic Kurdish and Arab people in Northern Syria adhere to Sunni Islam, while ethnic Assyrian people generally are Syriac Orthodox, Chaldean Catholic, Syriac Catholic or adherents of the Assyrian Church of the East. The dominant PYD party and the political administration in the region are decidedly secular and laicist. This list includes all cities and towns in the region with more than 10,000 inhabitants. The population figures are given according to the 2004 Syrian census. Cities highlighted in light grey are partially controlled by the Damascus government. Currently, the relations of the region to the Damascus government are determined by the context of the Syrian civil war. The Constitution of Syria and the Constitution of North and East Syria are legally incompatible with respect to legislative and executive authority. In the military realm, combat between the People's Protection Units (YPG) and Syrian government forces has been rare, in the most notable instances some of the territory still controlled by the Syrian government in Qamishli and al-Hasakah has been lost to the YPG. In some military campaigns, in particular in northern Aleppo governate and in al-Hasakah, YPG and Syrian government forces have tacitly cooperated against Islamist forces, the Islamic State of Iraq and the Levant (ISIL) and others. We believe that a federal system is ideal form of governance for Syria. We see that in many parts of the world, a federal framework enables people to live peacefully and freely within territorial borders. The people of Syria can also live freely in Syria. We will not allow for Syria to be divided; all we want is the democratization of Syria; its citizens must live in peace, and enjoy and cherish the ethnic diversity of the national groups inhabiting the country. In March 2015, the Syrian Information Minister announced that his government considered recognizing the Kurdish autonomy "within the law and constitution". While the region's administration is not invited to the Geneva III peace talks on Syria, or any of the earlier talks, Russia in particular calls for the region's inclusion and does to some degree carry the region's positions into the talks, as documented in Russia's May 2016 draft for a new constitution for Syria. In October 2016, there were reports of a Russian initiative for federalization with a focus on northern Syria, which at its core called to turn the existing institutions of the region into legitimate institutions of Syria; also reported was its rejection for the time being by the Syrian government. The Damascus ruling elite is split over the question whether the new model in the region can work in parallel and converge with the Syrian government, for the benefit of both, or if the agenda should be to centralize again all power at the end of the civil war, necessitating preparation for ultimate confrontation with the region's institutions. A June 2017 analysis described the region's "relationship with the regime fraught but functional" and a "semi-cooperative dynamic". In late September 2017, Syria's Foreign Minister said that Damascus would consider granting Kurds more autonomy in the region once ISIL is defeated. The region's dominant political party, the Democratic Union Party (PYD), is a member organisation of the Kurdistan Communities Union (KCK) organisation. As KCK member organisations in the neighbouring states with Kurdish minorities are either outlawed (Turkey, Iran) or politically marginal with respect to other Kurdish parties (Iraq). Expressions of sympathy for Syrian Kurds have been numerous among Kurds in Turkey. During the Siege of Kobanî, some ethnic Kurdish citizens of Turkey crossed the border and volunteered in the defense of the town. The region's relationship with the Kurdistan Regional Government in Iraq is complicated. One context is that the governing party there, the Kurdistan Democratic Party (KDP), views itself and its affiliated Kurdish parties in other countries as a more conservative and nationalist alternative and competitor to the KCK political agenda and blueprint in general. The political system of Iraqi Kurdistan stands in stark contrast to the region's system. Like the KCK umbrella organization, the PYD has some anti-nationalist ideological leanings while having Kurdish nationalist factions as well. They have traditionally been opposed by the Iraqi-Kurdish KDP-sponsored Kurdish National Council in Syria with more clear Kurdish nationalist leanings. The region's most notable role in the international arena is comprehensive military cooperation of its militias under the Syrian Democratic Forces (SDF) umbrella with the United States and the international (US-led) coalition against the Islamic State of Iraq and the Levant. In a public statement in March 2016, the day after the declaration of the regions autonomy, U.S. Defense Secretary Ashton Carter praised the People's Protection Units (YPG) militia as having "proven to be excellent partners of ours on the ground in fighting ISIL. We are grateful for that, and we intend to continue to do that, recognizing the complexities of their regional role." Late October 2016, U.S. Army Lt. Gen. Stephen Townsend, the commander of the international Anti-ISIL-coalition, said that the SDF would lead the impending assault on Raqqa, ISIL's stronghold and capital, and that SDF commanders would plan the operation with advice from American and coalition troops. At various times, the U.S. deployed U.S. troops embedded with the SDF to the border between the region and Turkey, in order to deter Turkish aggressions against the SDF. In February 2018, the United States Department of Defense released a budget blueprint for 2019 with respect to the region, which included $300 million for the Syrian Democratic Forces (SDF) and $250 million for border security. In April 2018, the President of France, Emmanuel Macron dispatched troops to Manbij and Rmelan in a bid to assist Syrian Democratic Forces (SDF) militias and in order to defuse tensions with Turkey. In the diplomatic field, the de facto autonomous region lacks any formal recognition. While there is comprehensive activity of reception of the region's representatives and appreciation with a broad range of countries, only Russia has on occasion openly supported the region's political ambition of federalization of Syria in the international arena, while the U.S. does not. After peace talks between Syrian civil war parties in Astana in January 2017, Russia offered a draft for a future constitution of Syria, which would, among other things, change the "Syrian Arab Republic" into the "Republic of Syria", introduce decentralized authorities as well as elements of federalism like "association areas", strengthen the parliament at the cost of the presidency, and realize secularism by abolishing Islamic jurisprudence as a source of legislation. The region opened official representation offices in Moscow during 2016, Stockholm, Berlin, Paris, and The Hague. A broad range of public voices in the U.S. and Europe have called for more formal recognition of the region. Notable international cooperation has been in the field of educational and cultural institutions, like the cooperation agreement of Paris 8 University with the newly founded University of Rojava in Qamishli, or planning for a French cultural centre in Amuda. ^ a b "Syrian Kurds declare Qamishli as capital for the new federal system". ARA News. 5 July 2016. Archived from the original on 8 July 2016. Retrieved 5 July 2016. ^ a b c "Syrian Kurds declare new federation in bid for recognition". Middle East Eye. 17 March 2016. ^ "War Statistics / Syrian War Statistics - Syrian Civil War Map". Syrian Civil War Map - Live Middle East Map/ Map of the Syrian Civil War. ^ a b Fabrice Balanche. "Sectarianism in Syria's Civil War" (PDF). The Washington Institute for Near East Policy. p. 24. ^ a b "Electoral Commission publish video of elections 2nd stage | ANHA". hawarnews.com. 1 December 2017. ^ "Delegation from the Democratic administration of Self-participate of self-participate in the first and second conference of the Shaba region". Cantonafrin.com. 4 February 2016. Retrieved 12 June 2016. ^ "Strangers in a Tangled Wilderness". Retrieved 31 July 2017. ^ "Fight For Kobane May Have Created A New Alliance In Syria: Kurds And The Assad Regime". International Business Times. 8 October 2014. Retrieved 18 February 2015. ^ a b "Syria's war: Assad on the offensive". The Economist. 13 February 2016. Retrieved 1 May 2016. ^ a b "Syria Kurds challenging traditions, promote civil marriage". ARA News. 20 February 2016. Archived from the original on 22 February 2016. Retrieved 23 August 2016. ^ a b c Carl Drott (25 May 2015). "The Revolutionaries of Bethnahrin". Warscapes. Retrieved 8 October 2016. ^ a b "Kurdish 'Angelina Jolie' devalued by media hype". BBC. 12 September 2016. Retrieved 12 September 2016. ^ "PYD leader: SDF operation for Raqqa countryside in progress, Syria can only be secular". ARA News. 28 May 2016. Retrieved 8 October 2016. ^ a b c d e f g h Ross, Carne (30 September 2015). "The Kurds' Democratic Experiment". New York Times. Retrieved 20 May 2016. ^ In der Maur, Renée; Staal, Jonas (2015). "Introduction". Stateless Democracy (PDF). Utrecht: BAK. p. 19. ISBN 978-90-77288-22-1. ^ Jongerden, Joost (5–6 December 2012). "Rethinking Politics and Democracy in the Middle East" (PDF). Ekurd.net. Retrieved 9 October 2016. ^ "The Constitution of the Rojava Cantons". Retrieved 14 May 2015. ^ a b c "ANALYSIS: 'This is a new Syria, not a new Kurdistan'". MiddleEastEye. 21 March 2016. Retrieved 25 May 2016. ^ Hassean Ridha. "Asayish forces arrest the head of Ras al-Ayn City Council Dr. Dahood Ezzat Salim Bik". Twitter. ^ a b By Rudaw. "Rudaw expresses regret over ban by Kobani authorities in Syria". Rudaw. ^ Glioti, Andrea. "Rojava: A libertarian myth under scrutiny". www.aljazeera.com. ^ a b Khalaf, Rana. "Governing Rojava Layers of Legitimacy in Syria" (PDF). The Royal Institute of International Affairs. ^ Yahya, Yahya (10 May 2016). "The PYD & the PKK: two sides of a coin". The Hill. Capitol Hill Publishing Corp. Retrieved 7 January 2019. ^ "Yekîneya Antî Teror a Rojavayê Kurdistanê hate avakirin". Ajansa Nûçeyan a Hawar (in Kurdish). 7 April 2015. Archived from the original on 12 May 2015. Retrieved 13 May 2015. ^ a b "Syria civil war: Kurds declare federal region in north". Aljazeera. 17 March 2016. ^ Bradley, Matt; Albayrak, Ayla; Ballout, Dana. "Kurds Declare 'Federal Region' in Syria, Says Official". Wall Street Journal. ISSN 0099-9660. Retrieved 18 March 2016. ^ "Reşnivîsa Hevpeymana Civakî ya Federaliya Demokratîk a Bakurê Sûriyeyê – ANHA". ku.hawarnews.com. ^ "Hevpeymana Civakî ya Federaliya Demokratîk ji bo Bakurê Sûriyê". ^ "Second day of Northern Syria Constituent Assembly conference takes place". Hawar News Agency. 28 December 2016. Archived from the original on 11 June 2017. Retrieved 28 December 2016. ^ "Syrian Kurdish groups, allies say approve blueprint for federal system". Reuters. 29 December 2016. Retrieved 1 January 2017. ^ "'Rojava' no longer exists, 'Northern Syria' adopted instead". Kurdistan24. 31 December 2016. Retrieved 1 January 2017. ^ "ܩܝܡܐ ܟܢܘܫܝܝܐ ܕܦܕܪܐܠܝܘܬ݂ܐ ܕܝܡܩܪܐܛܝܬܐ ܕܓܪܒܝ ܣܘܪܝܐ". ^ a b "The Autonomous Administration in Northern Syria: Questions of Legitimacy and Identity". Omran Center for Strategic Studies. 26 July 2018. Retrieved 14 February 2019. ^ Assyria 1995: Proceedings of the 10th Anniversary Symposium of the Neo-Assyrian Text Corpus Project / Helsinki, September 7–11, 1995. ^ Crook, JA; et al. (1985). The Cambridge Ancient History Volume 9: The Last Age of the Roman Republic, 146–43 BC. Cambridge: Cambridge University Press. p. 603. ISBN 978-1139054379. ^ Andrea, Alfred J.; Overfield, James H. (2015). The Human Record: Sources of Global History, Volume I: To 1500 (8 ed.). Cengage Learning. p. 133. ISBN 978-1305537460. ^ Daryaee, Touraj (2014). Sasanian Persia: The Rise and Fall of an Empire. I.B.Tauris. p. 33. ISBN 978-0857716668. ^ Philip G. Kreyenbroek, Stefan Sperl (1992). The Kurds: a contemporary overview (Reprint. ed.). London: Routledge. p. 114. ISBN 0-415-07265-4. ^ Yildiz, Kerim (2005). The Kurds in Syria : the forgotten people (1. publ. ed.). London [etc. ]: Pluto Press, in association with Kurdish Human Rights Project. p. 25. ISBN 0745324991. ^ Tejel, Jordi (2008). Syria's Kurds: history, politics and society (1. publ. ed.). London: Routledge. p. 10. ISBN 0415424402. ^ a b R. S. Stafford (2006). The Tragedy of the Assyrians. pp. 24–25. ^ Tejel, Jordi (2008). Syria's Kurds: History, Politics and Society (PDF). pp. 25–29. ^ a b c d e f "The Silenced Kurds". Human Rights Watch. 8 (4). October 1996. ^ Marcus, Aliza (2009). Blood and belief: the PKK and the Kurdish fight for independence (1. publ. in paperback. ed.). New York: New York University Press. p. 61. ISBN 0814795870. ^ "After 52-year ban, Syrian Kurds now taught Kurdish in schools". Al-Monitor. 6 November 2015. ^ a b Abboud, Samer N. (2015). Syria. John Wiley & Sons. ISBN 0745698018. ^ "Efrîn Economy Minister: Rojava Challenging Norms Of Class, Gender And Power". ^ a b c d "Persecution and Discrimination against Kurdish Citizens in Syria, Report for the 12th session of the UN Human Rights Council" (PDF). Office of the United Nations High Commissioner for Human Rights. 2009. ^ Tejel, Jordi; Welle, Jane (2009). Syria's kurds history, politics and society (PDF) (1. publ. ed.). London: Routledge. pp. X–X. ISBN 0-203-89211-9. Archived from the original (PDF) on 4 March 2016. Retrieved 7 August 2015. ^ a b c "A murder stirs Kurds in Syria". The Christian Science Monitor. ^ "HRW World Report 2010". Human Rights Watch. 2010. ^ "Armed Kurds Surround Syrian Security Forces in Qamishli". Rudaw. 22 July 2012. Archived from the original on 24 July 2012. Retrieved 27 July 2012. ^ "Girke Lege Becomes Sixth Kurdish City Liberated in Syria". Rudaw. 24 July 2012. Archived from the original on 29 November 2012. Retrieved 27 July 2012. ^ "In Syria, a Battle Between Radical Leftism and Militant Islam". Harvard Political Review. 22 January 2017. Retrieved 22 January 2017. ^ "Syria's Kurds declare de-facto federal region in north". Associated Press. 17 March 2016. Retrieved 17 January 2017. ^ "Syrian Kurds in six-month countdown to federalism". 12 April 2016. Retrieved 19 June 2016. ^ "After approving constitution, what's next for Syria's Kurds?". Al-Monitor. 22 July 2016. Retrieved 22 July 2016. ^ "Kurds, Arabs and Assyrians talk to Enab Baladi about the "Federal Constitution" in Syria". 26 July 2016. Retrieved 26 July 2016. ^ a b "2014 Charter of the Social Contract of Rojava". Peace in Kurdistan. 29 January 2014. Retrieved 18 June 2016. ^ a b c Andrea Glioti, Rojava: A libertarian myth under scrutiny, Al-Jazeera (6 August 2016). ^ "Kurdish Supreme Committee in Syria Holds First Meeting". Rudaw. 27 July 2012. Retrieved 6 January 2014. ^ "Now Kurds are in charge of their fate: Syrian Kurdish official". Ekurd.net. Rudaw. 29 July 2012. Retrieved 6 January 2014. ^ "Writings of Obscure American Leftist Drive Kurdish Forces in Syria". Voice of America. 16 January 2017. ^ a b Gupta, Rahila (9 April 2016). "Rojava's commitment to Jineolojî: the science of women". openDemocracy. Retrieved 28 February 2017. ^ "المفوضية العليا للانتخابات - Komseriya Bilind Ya Hilbijartinan". Facebook.com. Retrieved 25 April 2018. ^ Rodi Said (22 September 2017). "Syrians vote in Kurdish-led regions of north". Reuters. ^ "Dêrîk congress decides to establish Democratic Syria Assembly". Firat News Agency. kurdishinfo. Retrieved 2 August 2016. ^ "Haytham Manna Elected Joint Chairman of Syrian Democratic Council". The Syrian Observer. 14 October 2015. Retrieved 26 May 2016. ^ "Executive Board of Democratic Syria Assembly elected". Ajansa Nûçeyan a Firatê English. Archived from the original on 20 December 2015. Retrieved 2 August 2016. ^ a b c "Striking out on their own". The Economist. ^ "Western Kurdistan's Governmental Model Comes Together". The Rojava Report. Retrieved 18 February 2015. ^ "Education in Rojava after the revolution". ANF. 16 May 2016. Retrieved 10 June 2016. ^ "After 52-year ban, Syrian Kurds now taught Kurdish in schools". Al-Monitor. 6 November 2015. Retrieved 18 May 2016. ^ "Rojava schools to re-open with PYD-approved curriculum". Rudaw. 29 August 2015. Retrieved 18 May 2016. ^ a b c "Hassakeh: Syriac Language to Be Taught in PYD-controlled Schools". The Syrian Observer. 3 October 2016. Retrieved 5 October 2016. ^ "Kurds introduce own curriculum at schools of Rojava". ARA News. 2 October 2015. Retrieved 18 May 2016. ^ "Revolutionary Education in Rojava". New Compass. 17 February 2015. Retrieved 10 May 2016. ^ "Education in Rojava: Academy and Pluralistic versus University and Monisma". Kurdishquestion. 12 January 2014. Archived from the original on 10 May 2016. Retrieved 18 May 2016. ^ "Syriac Christians revive ancient language despite war". ARA News. 19 August 2016. Retrieved 19 August 2016. ^ "Rojava administration launches new curriculum in Kurdish, Arabic and Assyrian". ARA News. 7 October 2016. Retrieved 7 October 2016. ^ "Syriacs will study their language in schools this year – ANHA". en.hawarnews.com. ^ "The Syriacs are taught their language for the first time – ANHA". en.hawarnews.com. Archived from the original on 24 September 2016. Retrieved 25 September 2017. ^ "What is reality of educational process in North Syria, new year's curricula? - ANHA | Ajansa Nûçeyan a Hawar". hawarnews.com. ^ a b "Kurds establish university in Rojava amid Syrian instability". Kurdistan24. 7 July 2016. Retrieved 7 July 2016. ^ "The Assyrians of Syria: History and Prospects". AINA. 21 December 2015. Retrieved 18 May 2016. ^ "Christians, Kurds At Odds Over Syria School Curriculum". Al Shahid News. 13 September 2018. ^ "Why Did the Kurdish "Self-Management" Close the Syriac Private School in Eastern al-Hasakah?". Enab Baladi. 11 August 2018. ^ By Rudaw. "Rojava authority's efforts to provide Syriac education met with resistance". Rudaw. ^ Wladimir van Wilgenburg. "Syrian Kurds open church in Kobani, once besieged by IS". Kurdistan24. ^ Delil Souleiman. "Syriacs protest Kurdish authorities over Syria school curriculum". Yahoo News. ^ "Revolutionary Education in Rojava". New Compass. 17 February 2015. Retrieved 18 May 2016. ^ "Syria's first Kurdish university attracts controversy as well as students". Al-Monitor. 18 May 2016. Archived from the original on 21 May 2016. Retrieved 19 May 2016. ^ "'University of Rojava' to be opened". ANF. 4 July 2016. Archived from the original on 4 January 2017. Retrieved 4 July 2016. ^ "Rojava university seeks to eliminate constraints on education in Syria's Kurdish region". ARA News. 15 August 2016. Retrieved 15 August 2016. ^ a b "Syria Country report, Freedom of the Press 2015". Freedom House. 2015. Retrieved 9 July 2016. ^ "In blow to Kurdish independent media, Syrian Kurdish website shuts down". ARA News. 15 May 2016. Retrieved 9 July 2016. ^ "Syria's first Kurdish radio station burnt". Kurdistan24. 27 April 2016. Retrieved 6 July 2016. ^ "Syrian Kurdish administration condemns burning of radio ARTA FM office in Amude". ARA News. 27 April 2016. Retrieved 9 July 2016. ^ انترنت في الحسكة والقامشلي خلال 10 أيام (in Arabic). syriannewscenter.net. 12 January 2017. Retrieved 13 January 2017. ^ "Kurdish art, music flourish as regime fades from northeast Syria". Al-Monitor. 19 July 2016. Retrieved 20 July 2016. ^ هيئة الثقافة تفتتح معرضاً في سري كانيه بالحسكة (in Arabic). ARA News. 12 September 2015. ^ "Syrian Kurds hold theatre festival in Rojava amid war". Kurdistan24. April 2017. Retrieved 19 April 2017. ^ a b "Efrîn Economy Minister Yousef: Rojava challenging norms of class, gender and power". Diclenews.com. Retrieved 18 February 2015. ^ a b c "Rojava's Sustainability and the PKK's Regional Strategy". Washington Institute. 24 August 2016. ^ "Will Syria's Kurds succeed at self-sufficiency?". 3 May 2016. Archived from the original on 8 May 2016. Retrieved 18 May 2016. ^ "Flight of Icarus? The PYD's Precarious Rise in Syria" (PDF). International Crisis Group. Archived from the original (PDF) on 20 February 2016. Retrieved 3 December 2014. ^ a b "Efrîn Economy Minister: Rojava Challenging Norms Of Class, Gender And Power". 22 December 2014. ^ "Poor in means but rich in spirit". Ecology or Catastrophe. Retrieved 18 February 2015. ^ Wladimir van Wilgenburg (11 July 2017). "Rojava Administration to Impose Tax System in Northern Syria". Co-operation in Mesopotamia. ^ "In Syria's Mangled Economy, Truckers Stitch Together Warring Regions". Wall Street Journal. 24 May 2016. Retrieved 24 May 2016. ^ "Kurds Fight Islamic State to Claim a Piece of Syria". The Wall Street Journal. ^ "Das Embargo gegen Rojava". TATORT (Kurdistan Delegation). Retrieved 7 August 2015. ^ "Syrian Kurds risk their lives crossing into Turkey". Middle East Eye. 29 December 2014. Retrieved 11 January 2015. ^ "Rojava: The Economic Branches in Detail". cooperativeeconomy.info. 14 January 2017. Retrieved 16 January 2017. ^ a b "US welcomes opening of border between Rojava and Iraqi Kurdistan". ARA News. 10 June 2016. Retrieved 10 June 2016. ^ "Business booming in Rojava after outlet opened with Kurdistan Region". Kurdistan24. 22 April 2017. ^ "First aid convoy arrives in Rojava through new land corridor". ARA News. 26 June 2017. ^ "Iran-backed Iraqi force says takes Islamic State villages near Syria". Reuters. 29 May 2017. ^ "Iraq paramilitaries reach Iraq's border with Syria". ABC News. 29 May 2017. ^ "PKK planning to open trade route between Rojava and Iraq". Iraqi News. 4 June 2017. ^ a b "Rojava, Syria: A revolution of hope and healing". Vancouver Observer. 19 April 2017. Retrieved 19 April 2017. ^ "How do cooperatives work in Rojava?". cooperativeeconomy.info. Retrieved 16 January 2017. ^ Dr. Ahmad Yousef. "Rojava experience of the social economy : reality and prospects" (PDF). Sange.fi. Retrieved 25 April 2018. ^ A Small Key Can Open a Large Door: The Rojava Revolution (1st ed.). Strangers In A Tangled Wilderness. 4 March 2015. 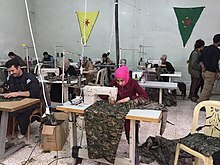 According to Dr. Ahmad Yousef, an economic co-minister, three-quarters of traditional private property is being used as commons and one quarter is still being owned by use of individuals...According to the Ministry of Economics, worker councils have only been set up for about one third of the enterprises in Rojava so far. ^ "Syria". Carnegie Endowment for International Peace. p. 13. Retrieved 16 November 2016. ^ "Islamic Family Law: Syria (Syrian Arab Republic)". Law.emory.edu. Retrieved 16 November 2016. ^ a b "Syrian Kurds tackle conscription, underage marriages and polygamy". ARA News. 15 November 2016. Archived from the original on 16 November 2016. Retrieved 16 November 2016. ^ "Power to the people: a Syrian experiment in democracy". Financial Times. 23 October 2015. Retrieved 6 June 2016. ^ a b "The New Justice System in Rojava". biehlonbookchin.com. 13 October 2014. Retrieved 6 June 2016. ^ "Syrian Kurds Get Outside Help to Manage Prisons". Voice of America. 23 September 2015. Retrieved 6 June 2016. ^ "Syria: Arbitrary detentions and blatantly unfair trials mar PYD fight against terrorism". Amnesty International. 7 September 2015. Retrieved 12 September 2016. ^ "Highest to Lowest – Prison Population Rate". World Prison Brief. ^ a b c "Rojava Asayish: Security institution not above but within the society". ANF. 6 June 2016. Archived from the original on 24 September 2016. Retrieved 6 June 2016. ^ Gold, Danny (31 October 2010). "Meet the YPG, the Kurdish Militia That Doesn't Want Help from Anyone". Vice. Retrieved 9 October 2014. ^ "Syria: Abuses in Kurdish-run Enclaves". Human Rights Watch. 18 June 2014. ^ "Syria". Amnesty International. 13 October 2015. ^ "Syria: Kurdish Forces Violating Child Soldier Ban". Hrw.org. 15 July 2015. Retrieved 25 April 2018. ^ "Prevent the rise of a North Korea-style Kurdish dictatorship". Jpost.com. Retrieved 25 April 2018. ^ "Under Kurdish Rule - Abuses in PYD-run Enclaves of Syria". Hrw.org. 19 June 2014. Retrieved 25 April 2018. ^ U.N. Security Council (5 June 2015). Report of the Secretary-General: Children and armed conflict (Report). para. 191. Actual numbers are expected to be higher.... A number of pro-Government groups, including Hizbullah, also reportedly recruited children in small numbers. ^ YPG demobilizes 21 children under the age of 18 from the military service in its ranks (Report). Syrian Observatory for Human Rights. 28 October 2015. Archived from the original on 21 November 2015. ^ "Amnesty accuses US-backed Syrian Kurdish group of demolishing homes". The Jerusalem Post. ^ "Syria: Kurdish Forces Violating Child Soldier Ban Despite Promises, Children Still Fight". Hurriyet Daily News. 24 October 2015. Retrieved 13 June 2016. ^ "Syrian Kurds give women equal rights, snubbing jihadists". Yahoo. 9 November 2014. ^ "Power to the people: a Syrian experiment in democracy". Financial Times. 23 October 2015. ^ a b c Meredith Tax (14 October 2016). "The Rojava Model". Foreign Affairs. Retrieved 28 October 2016. ^ a b c Si Sheppard (25 October 2016). "What the Syrian Kurds Have Wrought. The radical, unlikely, democratic experiment in northern Syria". The Atlantic. Retrieved 25 October 2016. ^ "Assyrian leader accuses PYD of monopolizing power in Syria's north". ARA. 23 March 2016. Retrieved 22 October 2016. ^ a b c "Syria rejects Russian proposal for Kurdish federation". Al-Monitor. 24 October 2016. ^ "Syrian Kurds provide safe haven for thousands of Iraqis fleeing ISIS". ARA News. 3 July 2016. Retrieved 2 July 2016. ^ "Rojava hosts thousands of displaced Iraqi civilians as war on ISIS intensifies". ARA News. 17 October 2016. Retrieved 18 October 2016. ^ Killing of Iraq Kurds 'genocide', BBC, "The Dutch court said it considered "legally and convincingly proven that the Kurdish population meets requirement under Genocide Conventions as an ethnic group"." ^ Bois, T.; Minorsky, V.; MacKenzie, D.N. (2009). "Kurds, Kurdistan". In Bearman, P.; Bianquis, T.; Bosworth, C. E.; van Donzel, E.; Heinrichs, W. P. (eds.). Encyclopaedia Islamica. Brill. The Kurds, an Iranian people of the Near East, live at the junction of more or less laicised Turkey. ... We thus find that about the period of the Arab conquest a single ethnic term Kurd (plur. Akrād) was beginning to be applied to an amalgamation of Iranian or iranicised tribes. ... The classification of the Kurds among the Iranian nations is based mainly on linguistic and historical data and does not prejudice the fact there is a complexity of ethnical elements incorporated in them. ^ "Culturally Sensitive Social Work Practice with Arab Clients in Mental Health Settings". Socialworkers.org. ^ Shoup, John A. Ethnic Groups of Africa and the Middle East: An Encyclopedia. ABC-CLIO. ISBN 9781598843620. ^ Barakat, Halim (1993). The Arab world society, culture, and state. Berkeley: University of California Press. ISBN 0520914422. ^ "Overview of Middle East - Minority Rights Group". Minority Rights Group. ^ Dona J. Stewart (22 December 2008). The Middle East Today: Political, Geographical and Cultural Perspectives. Routledge. p. 49. ISBN 978-1-135-98078-8. ^ Anthony Gorman; Andrew Newman (2009). Encyclopedia of the Peoples of Africa and the Middle East. Infobase Publishing. p. 32. ISBN 978-1-4381-2676-0. ^ W. Montgomery Watt; Pierre Cachia (1976). Who Is an Arab?. Carnegie Council. ^ a b Margaret Nydell (23 March 2012). Understanding Arabs, Fifth Edition: A Contemporary Guide to Arab Society. p. 169. ISBN 9780983955801. ^ a b John Joseph (2000). The Modern Assyrians of the Middle East. p. 30. ISBN 9004116419. ^ "Glavin: In Iraq and Syria, it's too little, too late". Ottawa Citizen. 14 November 2014. Retrieved 7 May 2016. ^ "HISTORY OF THE KURDISH LANGUAGE". Encyclopædia Iranica. ^ D. N. MacKenzie (1961). "The Origins of Kurdish". Transactions of the Philological Society: 68–86. ^ "Could Christianity be driven from Middle East?". BBC. 15 April 2015. Retrieved 15 April 2015. ^ "2004 Syrian Census" (PDF). Cbssyr.org. 2004. Archived from the original (PDF) on 10 March 2013. Retrieved 22 May 2016. ^ Rojava authorities. "Announce elections". Rudaw. ^ Muslim, Salim. "Only way to keep Syria united by the adoption of a decentralised, democratic and secular system". vrede.be. Vrede vzw. Retrieved 5 January 2018. ^ Iddon, Paul (10 September 2017). "The power plays behind Russia's deconfliction in Afrin". Rudaw. Rudaw. Rudaw. Retrieved 5 January 2018. ^ "Kurdish force may leave Raqqa campaign if Turkey continues attacks". Rudaw. Rudaw. Rudaw. 28 July 2017. Retrieved 5 January 2018. ^ "Syrian Kurdish Official to Sputnik: 'We Won't Allow Dismemberment of Syria'". Sputnis News. 12 July 2016. Retrieved 12 July 2016. ^ "KRG: Elections in Jazira are Not Acceptable". Basnews. 14 March 2015. Archived from the original on 16 March 2015. Retrieved 15 March 2015. ^ "Syrian Kurds point finger at Western-backed opposition". Reuters. 23 May 2016. Retrieved 24 May 2016. ^ a b "Russia finishes draft for new Syria constitution". Now.MMedia/Al-Akhbar. 24 May 2016. Retrieved 24 May 2016. ^ Ghadi Sary (September 2016). "Kurdish Self-governance in Syria: Survival and Ambition" (PDF). Chatham House. ^ Sam Heller (30 June 2017). "The Signal in Syria's Noise". warontherocks.com. ^ "Syria to consider granting Kurds greater autonomy". Aljazeera.com. Retrieved 25 April 2018. ^ "What Kobani Means for Turkey's Kurds". The New Yorker. 8 November 2014. ^ "6 reasons why Turkey's war against the PKK won't last". Al-Monitor. 8 September 2015. Archived from the original on 28 March 2016. Retrieved 20 May 2016. ^ "Kurdish Militants and Turkey's New Urban Insurgency". War On The Rocks. 23 March 2016. Retrieved 20 May 2016. ^ "Kurdistan's Politicized Society Confronts a Sultanistic System". Carnegie Middle East Center. 18 August 2015. Retrieved 8 June 2016. ^ "Syrian Kurdish leader: We will respect outcome of independence referendum". ARA News. 3 August 2016. Retrieved 4 August 2016. ^ "Inside Syria: Kurds Roll Back ISIS, but Alliances Are Strained". New York Times. 10 August 2015. Retrieved 28 October 2016. ^ Wladimir von Wilgenburg (23 May 2016). "ANALYSIS: Kurds welcome US support, but want more say on Syria's future". MiddleEastEye. Retrieved 28 October 2016. ^ "Pentagon chief praises Kurdish fighters in Syria". Hurriyet Daily News. 18 March 2016. Retrieved 28 October 2016. ^ "US general: Syrian Democratic Forces will lead the assault on Raqqa". Stars and Stripes. 26 October 2016. Retrieved 31 October 2016. ^ "Ever-closer ties between US and Kurds stoke Turkish border tensions". The Guardian. 1 May 2017. ^ "Kurdish citizens 'rest easy' after American military patrols parade through cities in northern Syria". syriadirect.org. 2 May 2017. ^ a b "How the US stood with Syria's Kurds". Al-Monitor. 4 May 2017. ^ "Pentagon budget retains same troop levels in Iraq, Syria". Al-Monitor. 12 February 2018. Archived from the original on 13 February 2018. Retrieved 13 February 2018. ^ "Syrie : Emmanuel Macron annonce l'envoi de soldats au secours des Kurdes" (in French). Le Parisien. 29 March 2018. ^ "First French Ground Troops Arrive in Northern Syria". Mintpress. 5 April 2018. ^ Taştekin, Fehim (12 February 2015). "Hollande-PYD meeting challenges Erdogan". Al-Monitor. ^ "YPJ Commander Nesrin Abdullah speaks in Italian Parliament". JINHA. 23 June 2015. Retrieved 9 June 2016. ^ "Syrian Kurdish PYD, Turkey's HDP leaders attend 'Ocalan conference' in Athens". eKurd. 17 February 2016. Retrieved 13 October 2016. ^ "Build Kurdistan relationship or risk losing vital Middle East partner – News from Parliament". UK Parliament. Retrieved 22 May 2016. ^ "Rome Declares Kobane 'Sister City'". Kurdishquestion. 5 April 2015. Retrieved 19 August 2016. ^ "Mark C. Toner, Deputy Spokesperson. Daily Press Briefing. Washington, DC. November 7, 2016". United States Department of State. 7 November 2016. Retrieved 7 November 2016. ^ "US-led coalition has no intention to create federal Kurdish state in Syria: official". Ara news. 30 March 2017. Retrieved 12 April 2017. ^ رووداو تنشر مسودة الدستور السوري التي أعدها خبراء روس (in Arabic). Rudaw. Retrieved 26 January 2017. ^ "Rojava's first representation office outside Kurdistan opens in Moscow". Nationalia. 11 February 2016. Retrieved 28 October 2016. ^ "Syrian Kurds inaugurate representation office in Sweden". ARA News. 18 April 2016. Retrieved 22 May 2016. ^ "Berlin'de Rojava temsilciliği açıldı". Evrensel.net (in Turkish). 7 May 2016. Retrieved 22 May 2016. ^ "Syrian Kurds open unofficial representative mission in Paris". Al Arabiya. 24 May 2016. Retrieved 22 May 2016. ^ "Syrian Kurds inaugurate representation office in the Netherlands". ARA News. 8 September 2016. Retrieved 8 September 2016. ^ Steven A. Cook (14 March 2016). "Between Ankara and Rojava". Foreign Affairs. Retrieved 9 June 2016. ^ Kamran Matin (12 December 2016). "The Geneva Peace Talks on Syria and the Kurds". NRT. Retrieved 18 December 2016. ^ "Rojava university seeks to eliminate constraints on education in Syria's Kurdish region". ARA News. 15 August 2016. ^ "L'écrivain Patrice Franceschi veut créer un centre culturel au Kurdistan syrien". Europe1. 27 March 2016. ^ "French delegation seeks to open cultural center in Rojava". NRT. 9 August 2016. ^ "Kurds plan to set up French institute in Syria". ARA News. 8 September 2016. ^ "From Rep. of Turkey Ministry of Foreign Affairs". Archived from the original on 5 December 2016. Retrieved 28 October 2016. ^ "Turkish President Erdoğan slams US over YPG support". Hurryiet Daily News. 28 May 2016. Retrieved 2 November 2016. ^ "How Can Turkey Overcome Its Foreign Policy Mess?". Lobolog (Graham E. Fuller). 19 February 2016. Retrieved 28 October 2016. ^ "Syria's Afrin: a plundered settlement one year on". Retrieved 23 March 2018. ^ Wladimir van Wilgenburg (12 June 2015). "The Rise of Jaysh al-Fateh in Northern Syria". Jamestown Foundation. Retrieved 28 October 2016. ^ David L. Phillips (11 September 2014). "Research Paper: ISIS-Turkey Links". Huffington Post. Retrieved 28 October 2016. ^ "Senior Western official: Links between Turkey and ISIS are now 'undeniable'". Businessinsider. 28 July 2015. Retrieved 28 October 2016. ^ Burak Bekdil (Summer 2015). "Turkey's Double Game with ISIS". Middle East Quarterly. Retrieved 28 October 2016. ^ "Turkey accused of shelling Kurdish-held village in Syria". The Guardian. 27 July 2015. Retrieved 9 June 2016. ^ "Turkey strikes Kurdish city of Afrin northern Syria, civilian casualties reported". ARA News. 19 February 2016. Archived from the original on 3 November 2016. Retrieved 9 June 2016. ^ Christopher Phillips (22 September 2016). "Turkey's Syria Intervention: A Sign of Weakness Not Strength". Newsweek. Retrieved 28 October 2016. ^ Fehim Taştekin (9 September 2016). "US backing ensures Arab-Kurd alliance in Syria will survive". Al-Monitor. Archived from the original on 9 September 2016. Retrieved 28 October 2016. Wikimedia Commons has media related to Rojava.